Learn about great artists and their works, from Michelangelo to Picasso. This course reviews works of art by great artists through the centuries from Leonardo da Vinci and Raphael during the Renaissance, to artists such as Caravaggio and Jacques-Louis David as well as the artists Edouard Manet and Pablo Picasso in the 19th and 20th centuries. Great works of art such as The Last Supper by Leonardo, the frescos in the Sistine Chapel by Michelangelo to more modern works such as Guernica by Picasso are reviewed. This course will be of interest to professionals who work in the fields of art, design and graphics, to learners who are pursuing a career in the arts and to those who just love great works of art. 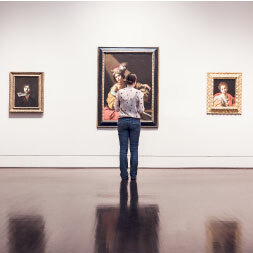 If you have ever stepped into an Art Museum saying to yourself that you wish you knew just a little more about how to appreciate great art, this course is for you. Upon completion of this course you will be able to: - Identify and discuss works of art by great artists during the Renaissance such as Michelangleo, Leonardo da Vinci and Raphael; - Identify and discuss works of art by great artists during the Baroque such as Caravaggio and Bernini; - and identify and discuss works of art by great artists such as Jacques-Louis David, Edouard Manet and Pablo Picasso.